The IRC806 provides the superior performance of a cooled MWIR sensor in a large format infrared imaging camera. 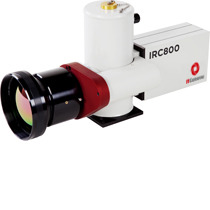 The IRC806 is a 20 micron camera that operates at up to 119 frames per second full frame, and supports sub windowing for even higher frame rates. With superior sensitivity and NEdT greater than 99.5% operability, and extremely high uniformity the IRC806 is the perfect choice for the most demanding MWIR imaging applications such as, materials evaluation, quality assurance and process analysis.